If you’re on the fence about taking your baby to a chiropractor, or if you’ve never heard this was even an option, you may be surprised at how useful it can be for managing your kids’ health. I had never used a chiropractor before, but my husband saw one after a car accident several years back. I knew they were great for helping with back pain and headaches, but that was the extent of my knowledge. It wasn’t until I had an infant with some health concerns that I decided to go forth and see a chiropractor for them, and I’ve never looked back. My daughter was six weeks old when I was told she had developed a condition called torticollis, which meant she had a head tilt from muscle tightness on one side of her neck. 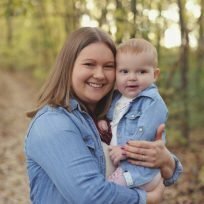 It wasn’t concerning and probably came about because of how she was positioned inside me during pregnancy, but the pediatrician warned me that if it wasn’t better in two weeks that we may have to do physical therapy for it. She was also having some problems with reflux and he wanted to try a medication for it if that hadn’t improved as well by our next well-child check. Before jumping into physical therapy and medications, I decided to check out a local chiropractor who had been treating my sister-in-law’s entire family for years. After meeting the doctor, he took a health history on both of us, and I was able to voice my concerns with my daughter’s neck muscles and reflux. I wasn’t planning on it, but I also started care with him because of vague symptoms in my upper back and shoulders, which was later determined to be from the hunched over position I took when breastfeeding the baby every two to three hours around the clock. I was expecting his hands to crunch down on my back, cracking ligaments into place like I was used to seeing, but his method of treatment was a small device, called an activator, which would deliver a little force to specific areas of my vertebrae and joints. Of course, being a former nurse and new mom, I was understandably a chiropractor’s dream as he clicked all around my back, hips, and neck making numerous adjustments here and there. When it was my baby’s turn, I laid her on my chest and she stared into my face looking rightfully confused, as the chiropractor checked out her neck and made some adjustments. We flipped her over and he clicked around some more on her chest—not that she was happy about it—and then it was over. He suggested probiotics to help with the reflux in addition to regular visits and I started my baby on them that day. After two weeks, when I returned to the pediatrician to get a recheck on her torticollis and reflux symptoms, I could inform her doctor that things had drastically improved. At home, I had worked on making sure my baby had her head turned the opposite way she favored because of the stiffness, and with the frequent chiropractic visits, her doctor told me he was satisfied with it, and to keep doing what I was doing with her because therapy was no longer needed. Her spit ups had gotten less and less and she wasn’t crying so much anymore. She never needed reflux medications. There are so many things I never realized a chiropractor can help with, especially in that first year. Their adjustments can help babies with reflux and gas issues and they can help them sleep better and cry less. There’s even been research done on the benefits of using a chiropractor for colic symptoms. They can help with breastfeeding issues, fussiness and ear infections. They can help correct alignment in a baby after a C-section or vaginal birth since delivery puts stress on a baby’s body. Since immune health relies on having a healthy spine, regular adjustments can help a baby’s body fight infection better. As an infant develops more control and starts lifting their head, crawling and walking, chiropractic adjustments help maintain their posture. It’s important to find a doctor who has expertise in treating pediatric patients. I felt comfortable with mine because he had experience in pediatrics, and because he didn’t do manual adjustments. I always felt my daughter was in good hands—literally. I have been getting monthly adjustments for the last two and a half years and will bring my daughter in now every so often to get aligned. She’s never been on antibiotics and continues to take probiotics from our chiropractor. I’ve learned so much about the human body how big a role the spine plays in everyday health. I have no regrets about starting with him, and make sure to let other moms know this is an option when facing concerns with their own kids. Visiting a chiropractor is definitely something I’m glad I pursued with my baby.